Donley County court and vital records are available from the Clarendon County/district clerk, who can be contacted by mail, email, fax, phone, or in person for records starting in 1903. Certified copies are restricted to qualified persons only for 25-75 years (75 years for birth certificates, and 25 years for death certificates), but informational copies have no restrictions. Duplicate copies are filed at the state level and available online at TexasOnline, the Texas eGovernment site. 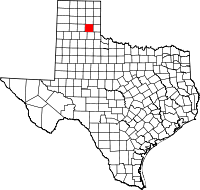 A small county (population 3700) created in 1876 out of Bexar District, Donley was settled by Methodist colonists from New York after the US Army drove out the Kiowas and Comanches in 1874-1875.